You’ve already seen what Carpisa has in store for their 2013 Spring and Summer wallet collection, but now you can check out their handbag collection for this summer. The 2013 collection pays tribute to the ‘50s and the accessories that were seen at Saint Tropez, that fascinating and legendary French actress Bridget Bardot brought to fame, or the renowned and celebrity-packed piazzette (squares) of Capri and Portofino in Italy. The style is vintage inspired and simply perfect for a weekend at a beach resort or a stroll down the boardwalk of a seaside town. The accessory brand brings us their tote bags made from natural colored straw, with flamboyant colored inserts that range from white to bright flou colors, like green, yellow and fuchsia, or with bright red and white polka dots, but they also have completely colored straw totes in either red, green and yellow, and also a pseudo scarf in vibrant fruit patterned prints that is wrapped around the handles and falls attractively on the side of the bag. There’s also smaller, all black tote with polka dot lining and the bag is embellished on the outside with a small black, white and red rosette, and there’s also another line of colored straw bags in white, electric blue, fuchsia or black that have a color matched fabric rosette. Their multicolored flowered print bags on a white or beige base, features an interesting bracelet handle that makes it a perfect accessory for any summer outfit. Carpisa also has an array of large transparent bags in eye-catching colors that are the clear choice for summer 2013. 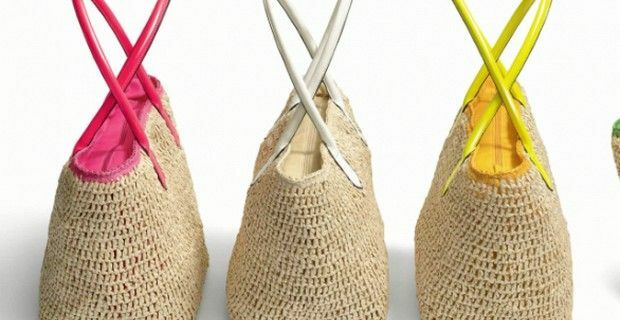 With a mix of straw and acrylic, the bags are large and perfect for a day at the beach and come in colors like fuchsia, turquoise and mint green. Italian Carpisa really does offer numerous solutions for this summer and all at very reasonable prices.